Many companies hire accounting services to help them take care of the financial side of their business while they focus on other business-related stuff. Accounting is defined as the recording of financial business transactions using systematic and comprehensive means. Accounting is important because it is a way for companies to know how much they are earning, where it came from, and where it is spent on. The government also requires financial data to be reported to IRS for tax purposes and this makes accounting a business necessity. 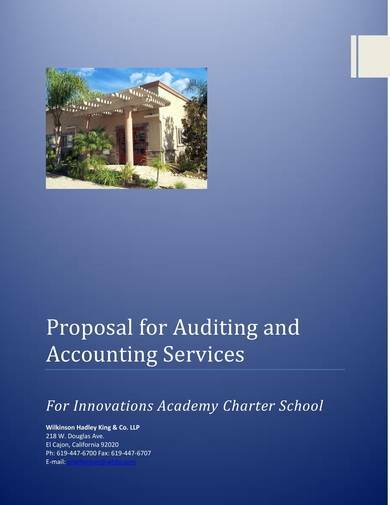 You can check out accounting proposal samples here and learn the steps on how to create one. 1. Know what a proposal is. 2. Gather samples and templates. 3. Start writing your draft using all the resources and references you have. 4. Review and finalize your work. 5. Submit to requesting companies or organizations. Accounting services are usually outsourced due to reasons like the company does not have enough people to build their own accounting department or the company can cut costs or save more with hiring third-party accounting services. This creates the need for an accounting services proposal. Here are some steps that will guide you with how to create one. Before you actually start writing your proposal, make sure that you know all that there is to know about proposals. Research and read materials that will help you fully understand the sense and purpose of a proposal. It is one of your keys to creating a high-quality and effective proposal that will definitely get noticed and selected. There are many proposal samples and templates that you can use as reference or study material. They can be any type of proposal sample, but the ones related to accounting are preferred. Some of the proposals that you can use are business investment proposal samples and templates and capital investment proposal samples and templates. There are tons of ideas that you can get from samples and templates, not to mention that they also provide tips and tricks to help you write better proposals. Now that you have enough knowledge about writing proposals, you can finally start writing your draft. Use the reference that you have gathered. Make sure that you include all the parts of the proposal, like the cover page or the title page, the introduction, executive summary, background history, etc. When you have completed the entire proposal, go over and review your work as many times until you are satisfied with it. Make necessary and appropriate changes to your proposal, but ensure that the contents stay relevant and coherent. After reviewing and making final changes, have your proposal printed and submit it to the companies or organizations requesting for the proposal. Make sure that you follow the guidelines that have been provided by the company or organization. Also submit your proposal on or before the set deadline. The sample proposal above is simple yet detailed. It provides adequate information about the qualifications of the accounting business and a list of the accounting and auditing jobs that they have performed within a particular year. The qualifications and experiences of each of the partner member and their employees are also provided. Other sections of the proposal include a table of contents for easy navigation, a scope of engagement, proposed fees, and references. 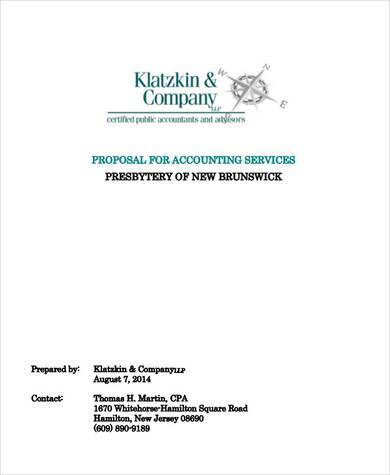 The accounting services proposal sample is an eight-page proposal with a simple and attractive design. A title page or cover page is provided, and each section of the sample is written in blue so that it ca be easily distinguished from the rest of the texts. The sections are also enumerated from A to E, namely background and philosophy, engagement approach and strategy, scheduling and staffing of engagement, engagement fees, and references. This sample proposal template is simple and very detailed. 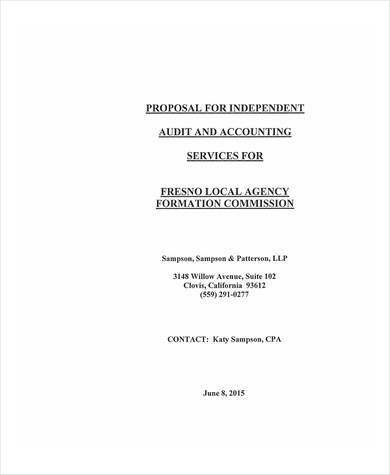 It can be used as reference and or as one’s own accounting proposal document. The sample uses a neat and professional-looking layout. Important parts of the proposal are written in bold so that they can be easily distinguished from the rest. The contents of the proposal includes an introduction, objectives, vision and mission, products and services offered, etc. This is another simple proposal sample that you can use to as reference or guide. 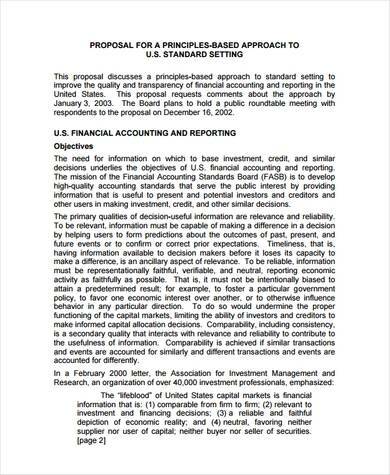 It is an accounting proposal that is specifically used for the principle-based approach to US standard setting. 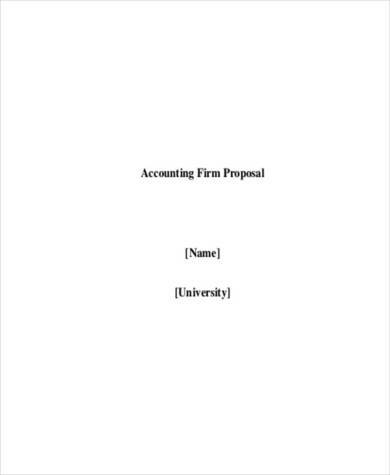 The sample is lengthy and includes several attachments that will help you with writing your own accounting proposal. 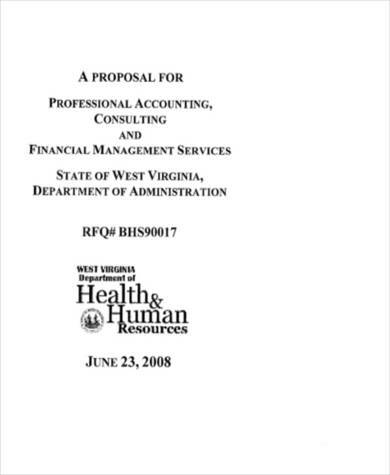 The accounting consulting proposal sample contains details about the provision of professional accounting, consulting and financial management services. This professional proposal includes details like general terms and conditions, instructions to bidders, executive summary and qualifications, about the company, etc. If you work as an independent accountant, then you will find this sample independent and accounting services proposal useful. It can help you with creating your own proposal and be hired as an accounting services provider of certain companies or businesses. There are many proposal samples that can help you create your own proposal. Some of these proposals you may find useful are property investment proposals and marketing proposals.